PreSonus LIVE airs twice today! 2 p.m. CST and 7 p.m. CST LIVE FROM BEN FOLDS STUDIO in Nashville! 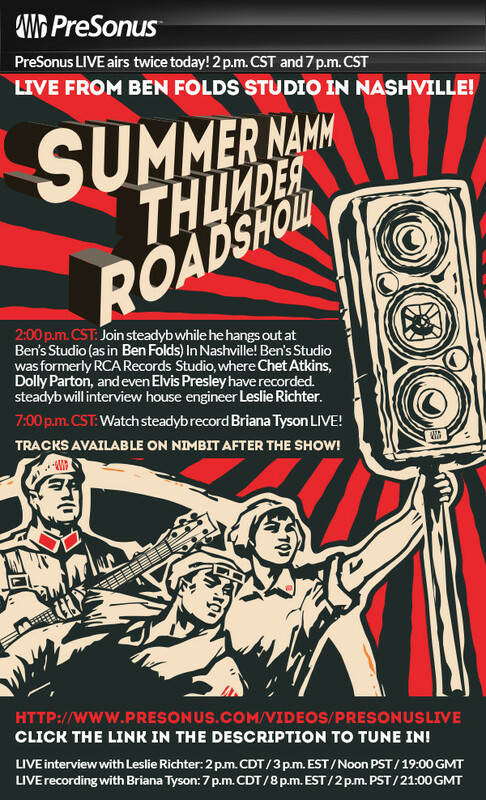 2:00 p.m. CST: Join steadyb while he hangs out at Ben’s Studio (as in Ben Folds) In Nashville! Ben’s Studio was formerly RCA Records Studio, where Chet Atkins, Dolly Parton, and even Elvis Presley have recorded. steadyb will interview house engineer Leslie Richter. 7:00 p.m. CST: Watch steadyb record Briana Tyson LIVE! Tracks available on Nimbit after the show!